How busy is skiing/boarding during European school holidays? Discussion in 'Europe' started by asammut_au, Sep 7, 2018. I am planning my first European ski trip for 2019 and am wondering a few things about skiing/boarding during European school holidays. I have been doing a bit of reading through the forums and picked up some fantastic tips ( thanks everyone ) but am still unsure of a few things. 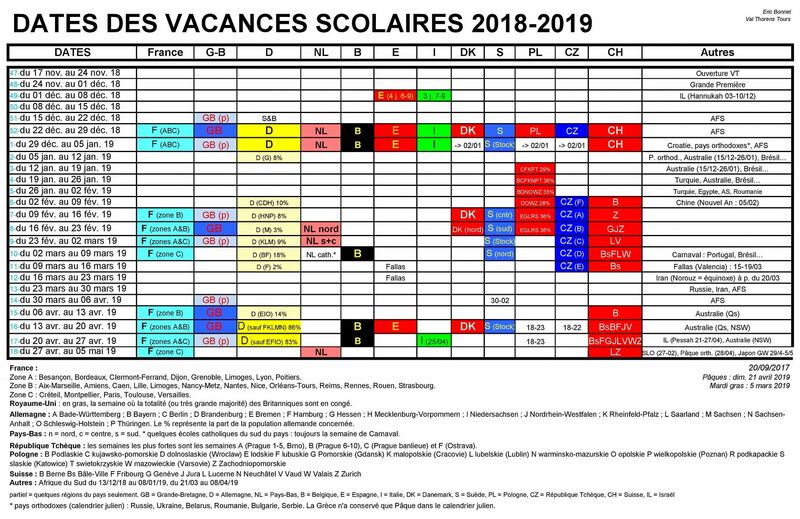 It seems like European half term school holidays for 2019 are scattered between the beginning of Feb till the end of the first week of March. Currently the plan is to ski in Zermatt for around a week and an Austrian resort for another 5 days or so. The four Austrian resorts i am currently deciding between are Solden, Ischgl, Serfaus and Lech. - Are the lift queues in Ischgl and Serfaus generally quieter then in Solden and Lech during school holidays? - How much are the lift queues in Zermatt affected by school holidays? And which country's holidays make Zermatt the busiest? Switzerland? France? Germany? - I have read that it is best to avoid skiing/boarding during the Parisian school holidays. Is this advice just for French resorts? Or does it include Zermatt and Austrian resorts? - I have read that the German and Dutch school holidays make the slopes in the Austrian resorts busier. Are there any Austrian resorts in my list which don't get as affected by German and Dutch holidays? - Are the times when the regional areas are on holidays less busy? Eg are the times when the non-Paris schools are on holidays less busy then when Parisian schools are on holidays? asammut_au and skiflat like this. The only bottle neck at Zermatt is the morning Gondola from the village base. Good questions, youv'e obviously already done a bit of research already - good to see. I don't have any definitive answers as I generally avoid the major areas in peak times, either going later in season or going to lesser known areas. I think you are right in saying that German & Dutch holidays are the main impact on Austrian resorts and Parisian holidays on French resorts. One thing though is to try and access the ski area away from a quieter location away from the main access point. For example a few years ago I was in Schladming in the lead up to Easter and the queues on the Planai gondola were pretty bad. But once I was able to get across to the Hauser Kaibling side it was fine, was able to ski top to bottom runs with almost no queue at all. I think the same will apply to many areas, pick your initial access point away from the main area. In my experience Fasching is the main busy-ness maker in Austria, it's not as affected by French or UK school holidays. It's also quite late next year and doesn't overlap with UK half term. So probably not too much to worry about tbh! Holidays are different in different european countries: You can have a look her and choose where not to go. Zeroz, Scoober, piolet and 1 other person like this. Thanks everyone for the responses. I really appreciate the help. Fasching is in the first week of March in 2019 is that correct? Does anyone happen to know if lift queues in Ischgl and Serfaus are generally quieter then in Solden and Lech during school holidays? Or is it all much of the same? Serfaus has excellent uphill capacity with modern Gondolas dispersing morning crowds very well . School hols the Komperdell and Masner restaurants and surounding slopes get busy, as does Shoenjochbahn and Sonnenbahn at Fiss/Ladis. Easier to find a quiet spot than Soelden or Lech- try backside of Zwolferkopf for mornings and late arvos ( Shongampalm or Zirbenhutte for brunch). The Trittkopf side of Lech does not get as much fluctuating crowds as the Petersboden side but can be busy first up for the plebs wanting to do the White Ring tour. Bad weather in the Arberg means you get extra traffic coming via bus from St. Anton ( Nasserain is hectic as is the Rendl valley run) and Zurs to Lech to ski the sheltered treed areas- ( was always our default choice ). I think you're just as likely to see fluctuations in the crowds depending on the day of the week. Around our place, Saturdays are changeover day and fairly quiet. On Sundays the locals come out to play and all the new arrivals are out finding their feet - a good day to avoid unless you can find somewhere out of the way. French almost always go skiing in France. Italians stick mainly to Italy but you do meet a few in AT and other places. Moreso the budget friendly places. Avoid school holiday periods. Aside from the first week, another good general rule is to skip Feb.
piolet and asammut_au like this. French hold can push in to March. I guess we can extend the nationality analysis a bit too. IMO most of these generalizations can be applied even more so to families and school holiday ski trips. Dutch may be an exception. Many of them are young party skiers, not families. Many of them are young party skiers, not families. Yes agree with all of that. That is pretty much my observation also. In the main Austrians, Swiss & French all largely stick to their home country. Quite logical when you consider it - all have so many great options at home there is no reason to cross borders. Main exception of course is Südtirol - the German speaking part of Italy, Austrians & Germans love going there. Yes the Brits do go most alpine countries. They have to travel anyway and with cheap flights and package deals there is plenty of choice. But definitely skewed to big name resorts where they have chalets and support staff. Germans though will be found in nearly every ski area in Austria, even the quite small out of the way ones. I saw plenty in Osttirol last year but encountered no Brits at all (no complaints there). The German visitors are certainly the most critical to the Austrian ski tourism industry. Also get quite a few Eastern Europeans - Poles, Czechs etc in parts of Austria. Swedes spread around a bit as well but I think certainly more so in France. In the main Austrians, Swiss & French all largely stick to their home country. Ah yes of course the Swiss go Swiss. Its how they generally roll!! Quite logical when you consider it - all have so many great options at home there is no reason to cross borders. Hmmm well it is and it isn't. I often think its a bit insular and self defeating. Not to mention wallet defeating in the case of the Swiss or French, to not venture elsewhere. Ok, I get it; when I meet an old man in Tirol who's lived there his whole life and drove trucks for a living, then yeah its understandable that he always skied local 'cos it was affordable. I do meet a lot of serious enthusiasts though who clearly have the disposable income to do so, but have never skied outside of their own country. I'd say they're a sizable majority when it come to the AT/FR divide. I think they do it kind of on autopilot. It just doesn't even occur to a lot of them, to seek some variety. I suspect the language might come into it. The Germans would have an easier time of it in Austria than France, for example. XTREMO, piolet and asammut_au like this. Language is definitely a big factor. Germans head in big numbers to Austria and Südtirol. Eastern Switzerland probably also but Swiss prices would be a limiting factor. CarveMan and asammut_au like this. Swiss prices would be a limiting factor. Oh yeah! We often ski into Switzerland from Avoriaz, but we make sure to get back into France before we stop for food. XTREMO, asammut_au and Hyst like this. I spent a lot of time reading over the 2017 & 2018 Europe threads and saw your pics from Zermatt @XTREMO Thanks for posting them I figured that it's not too likely to be that bad again and we are more in Zermatt for the views then awesome snow. I also figured that at least there would be something to play in on the groomers. Was the snow at least passable on the top half of the mountain when you were in Zermatt in 2017 @XTREMO ? I think you are quite safe with those two options. Both give you the option of regular alpine at the lower elevations plus the glaciers at higher elevations. The regular ski runs should be fine in January. Head up to the glaciers on a clear day. Kletterer and asammut_au like this. BTW I have skied Sölden in April. No snow in the valley, spring conditions in the alpine ie. good early but turning to slush, but glaciers were fine. January though will be quite different - you should be able to ski to the valley and stop off at one of the many Apres bars. Note the 'ö' in Sölden in the thread title didn't get translated properly in one of the forum migrations. edit. interesting looking back at my 11 year old thread. When you are in Sölden definitely head up the valley to Obergurgl/Hochgurgl for a day or two. It is usually included in a multi day lift pass. A slight digression. This is the Lyngen alps segment from the Warren Miller film featuring Lorraine Huber which led to me going there not long after. I figured that it's not too likely to be that bad again and we are more in Zermatt for the views then awesome snow. I also figured that at least there would be something to play in on the groomers. Was the snow at least passable on the top half of the mountain when you were in Zermatt in 2017? More than passable. Cervinia even had some powder pockets. Certainly not good by Euro standards but if all you've skied is Australia then it would have been a treat of sorts. I doubt it'll be like that again in Feb. Was just unlucky. True. That's why I find it a bit insular and narrow-minded. Part of the holiday experience (for many people) is to get a bit of variety when it comes to culture, food and language. Seems a shame to totally miss out on that. Each to their own though. asammut_au, Hyst and Piste Again like this.